During the few years he was on the jazz scene before his death, Fats Navarro was a strong influence on a whole generation of trumpet players. His playing was less fiery than Dizzy’s, but just as swinging. Eb Pob is one of his more well-known tunes. 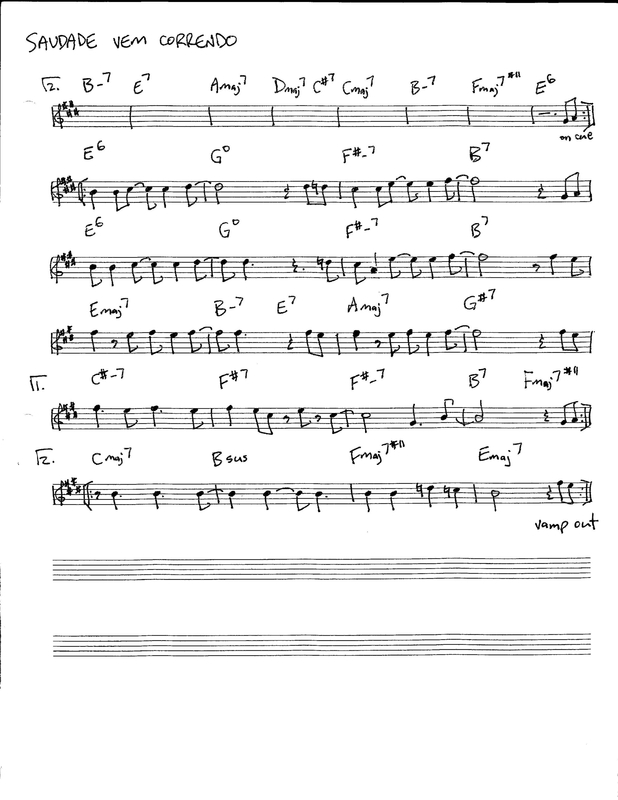 This entry was posted in Uncategorized and tagged Eb Pob, Fats Navarro, jazz, lead sheet, music, Noteheads, transcription on December 16, 2013 by noteheads. 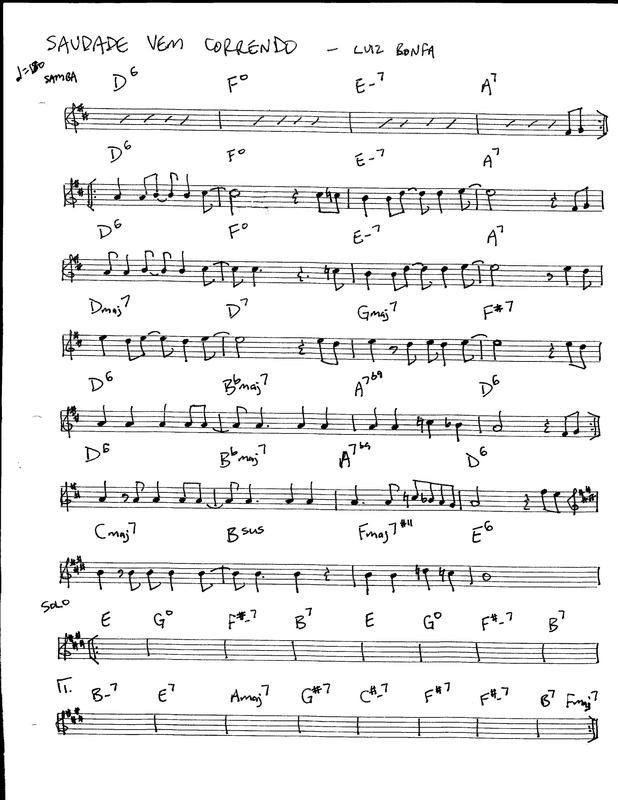 Last summer I was thumbing through the “free box” at a local record shop when I came across Jazz Samba Encore! by Stan Getz and Luiz Bonfa. Why it was in that bin I have no idea, the album sounds great and is full of pretty sambas and bossas. It is a great compliment to Getz’s collaborations with Charlie Byrd (Jazz Samba, 1962) and João Gilberto (Getz/Gilberto, 1964). This tune features the lilting vocals of Bonfa’s wife Maria Toledo, but what really got me excited was when I heard the short vamp they play at the end. Even a casual listener to 90’s hip hop will recognize it as the sample behind the Pharcyde’s classic “Runnin” (and more recently Wiz Khalifa’s “Name On A Cloud”). 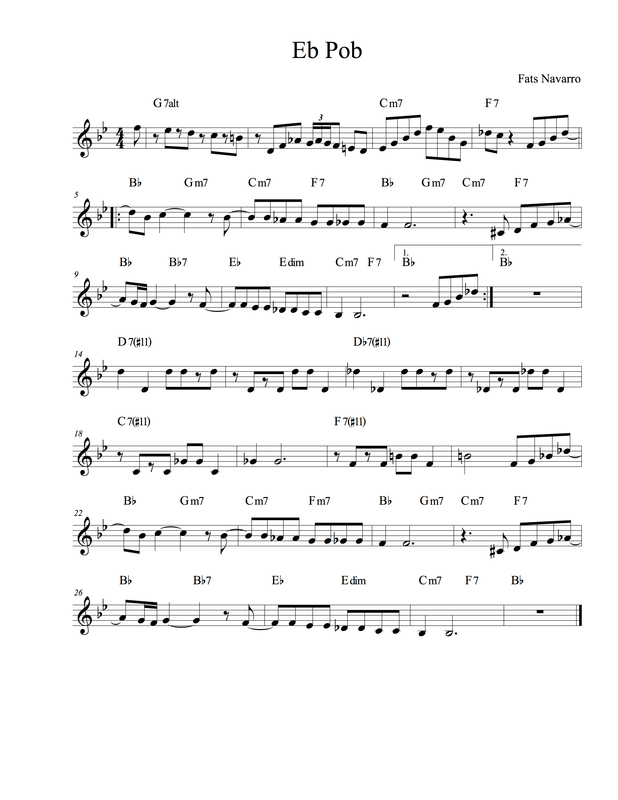 This entry was posted in Uncategorized and tagged jazz, lead sheet, Luiz Bonfa, music, Noteheads, Pharcyde sample, Saudade Vem Correndo, Stan Getz, transcription on December 9, 2013 by noteheads.